Blizzard and Facebook have announced a collaboration that will allow players to stream Overwatch and other Blizzard games directly to Facebook. Blizzard recently announced that more than 7 million people are already playing Overwatch, and today confirmed that cross-platform play between Xbox One and PlayStation 4 is something that the company will "keep an eye on." Further, Blizzard announced today the upcoming addition of "Facebook Login" when you play Blizzard's PC games, giving players the opportunity to sign up for, and log in to, Battle.net with their Facebook accounts. Players will also have the opportunity to "Go Live," or livestream directly to their Facebook timelines. Friends will be able to subscribe and receive notifications for streams. No other features were confirmed outside of streaming gameplay. "Blizzard games are best when played with friends, so it's important to us to provide our players with features and services that make it easy and fun to share their experiences with each other," said Gio Hunt, executive vice president of corporate operations at Blizzard Entertainment. "We're working closely with Facebook on this integration for Overwatch, as well as our other games, and we look forward to sharing further details on our plans as development progresses." "Blizzard has a passionate community of players, and an incredible track record for launching innovative and high-quality gaming experiences," said Leo Olebe, global games partnerships director at Facebook. "Our collaboration on Overwatch demonstrates Facebook's commitment to partnering with AAA game companies, while further empowering Blizzard gamers to connect and share the content they're most passionate about with the friends they play with around the world." 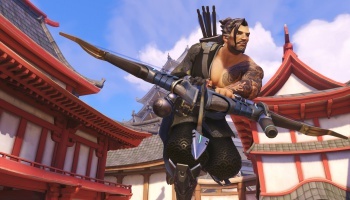 The shooter earned a 5-star rating here at The Escapist, with our review reading, in part: "Overwatch is a fast, fun, and fresh take on the class-based shooter. Blizzard has made sure its first new IP in 17 years is polished to perfection." The addition of ranked competitive mode, which was omitted from the game at the time of release, will be the first major update to the game, and Blizzard is hopeful for a late June launch. Nobody asked for this. Facebook is not a streaming service. Blizzard games dont need facebook integration. This is wrong on so many levels i dont even know where to start. Now i know i wouldnt play overwatch if my life depended on it. While not a feature I see myself using, I also don't really see any harm in it. As long as the facebook side of it remains optional then all they'r edoing is adding options for people to stream who maybe wouldn't normally since its a fairly easy thing now?